Diabetic ketoacidosis (DKA), often referred to as diabetic coma, is a serious medical situation for individuals with type 1 diabetes. This condition is extremely rare in people with type 2 diabetes. 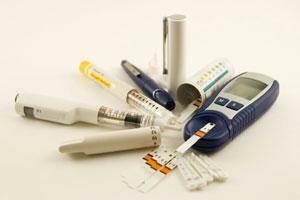 However, type 2 diabetics can experience a non-ketotic syndrome. While the information below focuses on DKA, both conditions can lead to coma, shock, respiratory distress, and death. Luckily, with proper healthcare intervention and continual attention and monitoring, the life-threatening conditions of diabetes can be avoided. When the amount of sugar rises in the blood, normal metabolic functions begin to malfunction and fail. One disruption is the proper acidity level of the blood. The substance behind the acidity: ketones. When your body does not have enough insulin, such as in untreated diabetes, muscles are unable to get the glucose they require. When they are starved of this nourishment, fat is broken down for their energy source. Ketones are the by-product of this breakdown. When your body does not excrete them faster than they form, the blood becomes poisoned by its high acid levels. Another aspect of DKA is dehydration. This state occurs because glucose is flowing into your urine, while at the same time, your kidneys are producing more urine. The excessive excretion of all this fluid causes the dehydration. An increased blood sugar level is the direct result of an inadequate supply of insulin or the malfunctioning of the insulin that is present. Insulin is a hormone made in the pancreas, which is located in the lower left side of the abdomen. Its production is triggered by the presence of sugar, also known as glucose, in the bloodstream. If insulin is not made or not working properly, glucose is not transported out of the blood and into the cells for energy. Instead, glucose levels begin to rise in the bloodstream. This is the condition known as diabetes. Diabetes not properly treated can lead to ketoacidosis. Diabetic ketoacidosis has been known to occur when a patient is under extreme stress and/or experiencing an illness. When the body is trying to conquer a bacterial infection, such as the flu, the liver can release stored glucose due to elevated hormone levels. These hormones can interfere with insulin function. Also, adolescents can be particularly at risk of entering DKA due to the intense psychological toll and peer pressure they must deal with when having to self-inject, keep track of injections, and monitor blood sugar levels. Since blood sugar levels while in this state are often found to be between 350 to 750 milligrams per deciliter (mg/dl) of blood, insulin injections are immediately administered. (Normal blood sugar levels are between 80 and 100 mg/dl.) Fluids are often given to replace the enormous volume that has been lost. In addition, if an insulin-dependent patient goes into ketoacidosis, mineral depletion follows. For this reason, magnesium, potassium, and other trace minerals are often replenished. The importance of regular, effective insulin injections cannot be overstated. Even one skipped dose can wreak havoc on this delicate, sensitive system. Also, being aware of the expiration date of the insulin can be a life-saving factor. Adequate, well-functioning supplies, such as insulin pumps, are critical as well. Monitoring ketone levels, as well as blood glucose levels is a priority to avoid this condition. Self-treatment and regular medical check-ups and testing are the chief preventative tactics, and also extremely doable. A proper, healthful diet and adequate exercise remain prime features of good care too. The American Diabetes Association is a major player in the prevention, treatment and cure of diabetes, both type 1 and type 2. There are several publications available to support and guide you, whether you are newly diagnosed, have been managing the disease for years, or are caring for someone with diabetes. Your medical care team should include your primary care physician, an endocrinologist, a nutritionist, and a psychiatrist for managing your total well-being. Because physical activity can alter hormone production and ratios in the body, it is critical to seek the attention of your medical team before engaging in any type of exercise.